The New Jersey Democrat, who is the second black candidate in a primary field that's already historically diverse, delivered his message of unity amid an era marked by bitter political division. 'I believe that we can build a country where no one is forgotten, no one is left behind; where parents can put food on the table; where there are good-paying jobs with good benefits in every neighborhood; where our criminal justice system keeps us safe, instead of shuffling more children into cages and coffins; where we see the faces of our leaders on television and feel pride, not shame,' Booker said in the video, subtly jabbing at President Donald Trump. The Republican Party took its own swipe at Booker on Friday. 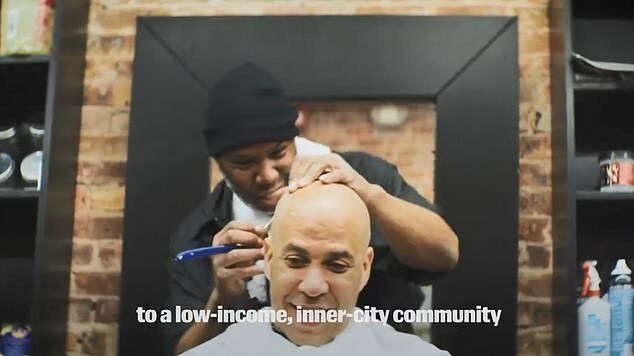 'Cory Booker is a political opportunist who left Newark ridden with crime and an ‘emblem of poverty,' GOP spokesman Michael Ahrens charged in a statement. 'Even the liberal base thinks he’s a disingenuous self-promoter, and his embrace of policies like higher taxes, single-payer health care, and government-guaranteed jobs make him totally out-of-touch with most Americans,' Ahrens added. But fellow New Jerseyan Chris Christie, the state's former governor and an adviser to the president, wouldnt dismiss the 'talented, smart, articulate' senator. Christie said during a Washington Post event on Thursday that Booker could distinguish himself among other Democrats by sticking with his previous positions in favor of school vouchers, charter schools and tough crime-fighting. 'If he stays in that lane, and is the articulate, inspirational guy that he is, then I think he’s got a legitimate chance to be a serious potential problem for the president in the general election,' he said. Booker enters what's shaping up to be a crowded presidential primary, with three of his fellow Democratic senators – Elizabeth Warren of Massachusetts, Kamala Harris of California and Kirsten Gillibrand of New York – already either declared or exploring a run. But he's spent months telegraphing his intentions to join the race, visiting the early-voting states of Iowa, New Hampshire and South Carolina to build connections with key powerbrokers. In October he cast a Senate vote against the confirmation of Supreme Court Justice Brett Kavanaugh, and promptly jetted to Iowa – the first state where voters pick primary candidates – to boast about it. Some of his past positions could help him win a Democratic primary but hobble him in a general election against Trump. He proposed legislation in December that would provide nest egg payments totaling up to $50,000 to low-income children, as a way to break 'generational' poverty. The funds would come out of taxpayers' pockets. And Republicans will do there best to make mincemeat of Booker for a fall 2018 moment that saw him compare himself to a Roman Empire gladiator. With a televised flourish in September, Booker released a collection of previously secret documents about Kavanaugh's views on racial profiling after the 9/11 terror attacks, and portrayed himself as a progressive crusader. He proclaimed that he was making the material public against the wishes of Republicans – despite the fact that they had already cleared them for publication the night before. 'This is about the closest I'll probably ever have in my life to an, "I am Spartacus" moment,' he said. Florida Republican Senator Marco Rubio skewered Booker's 'Spartacus moment' on Twitter. Booker, a former mayor of Newark, New Jersey's largest city, won a special Senate election in 2013 to replace Democrat Frank Lautenberg and then won a full Senate term in 2014. He will be able to run for a second full Senate term in 2020 while running for president, thanks to a law that New Jersey's governor signed in November. But that doesn't mean the 49-year-old's path to the nomination will be easy. As many as five more Democratic senators could soon mount their own primary bids, creating a competition for voters' attention, and several of Booker's rival presidential hopefuls bring higher name recognition to a race that may also feature popular former Vice President Joe Biden. Booker's father grew up in a low-income community in North Carolina, and the senator has recalled his family's later struggle to settle in suburban New Jersey amid discrimination against black homebuyers. Booker played a key role in the bipartisan criminal justice reform bill that Trump supported last year, for example, a deal he helped strike two months after sparring with Republicans during the battle over Supreme Court Justice Brett Kavanaugh's confirmation. In his announcement video, Booker invoked the fight against slavery and the role of immigration in building the nation's character. 'The history of our nation is defined by collective action; by interwoven destinies of slaves and abolitionists; of those born here and those who chose America as home; of those who took up arms to defend our country and those who linked arms to challenge and change it,' he said. Born in the nation's capital but raised in New Jersey, Booker made a name for himself as Newark mayor by personally shoveling the snow of residents. He has $4.1 million left in his campaign coffers that could also be used to assist his presidential run. Rather than opening an exploratory committee to test the waters, Booker took the direct step to open a campaign seeking the Democratic nomination.